The main aim of this book is to present recent ideas in logic centered around the notion of a consequence operation. We wish to show these ideas in a factually and materially connected way, i.e., in the form of a consistent theory derived from several simple assumptions and definitions. These ideas have arisen in many research centers. The thorough study of their history can certainly be an exciting task for the historian of logic; in the book this aspect of the theory is being played down. 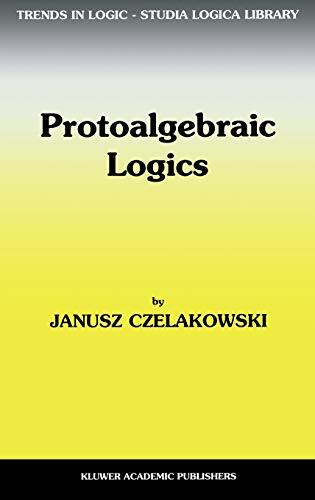 The book belongs to abstract algebraic logic, the area of research that explores to a large extent interconnections between algebra and logic. The results presented here concern logics defined in zero-order languages (Le., quantifier-free sentential languages without predicate symbols). The reach of the theory expounded in the book is, in fact, much wider. The theory is also valid for logics defined in languages of higer orders. The problem of transferring the theory to the level of first-order languages has been satisfactorily solved and new ideas within this area have been put forward in the work of Blok and Pigozzi .